What is Youth in Sports? Dr. Michael Axe, Walter Laudein and Paul Schweizer, talk with outstanding young people and others who make a difference in our community. 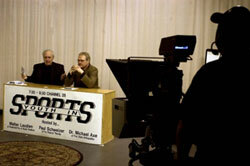 It is produced completely at Wilmington University’s TV Studio by students and faculty. Am I eligible to become a production assistant? This excellent opportunity is available for any junior or senior status student majoring in Video and Motion Graphics. What positions will I partake in? How many credits do I receive for serving as a production assistant? Students serving on the production crew may earn three credits towards their Senior Project or Internship requirement. Interested students should email CoT@wilmu.edu or call 302-356-6977 for more information.